“vinum regorum, rex vinorum” – the wine of kings and the king of wines. This is how King Louis XIV of France described Tokaji Aszú, arguably Hungary’s most famous wine. Originating in the 15th century, Aszú predates the more famous Sauternes by about 200 years and was championed by kings and czars throughout Europe. This wine was so highly respected that the Hungarian archbishop Draskovich presented it as a gift to Pope Pius IV at the Council of Trent in 1562. "Writers looked to it for inspiration and its virtues are included in the Hungarian national anthem." Tokaji Aszú primary ingredient: the Furmint grape. Tokaj is a region of land situated in eastern Hungary close to the Ukrainian border and Tokaji simply means “from Tokaj”. Tokaji Aszú is an ultra-sweet white wine and is characterized by an apricot and honey aroma and taste. In fact, it is one of a few wines where the aroma is exactly like the taste. The sweetness and quality of the wine is measured by puttonyos. The wine is made by selecting individual Furmint and Hárslevelu grapes affected by noble rot (Botrytis Cinerea). These grapes are collected in 2.5kg (55 lbs) tubs called “puttonyos”. The grapes in each tub are then mashed and dried into paste (Aszú). Then a certain amount of puttonyos (between 3 and 6) are added to 136 liters (36 gallons) of white grape must. The more puttonyos added to the base stock the sweeter and higher quality the wine. Finally, the wine is matured in small wooden barrels for seven years and later bottled in the classic white Tokaji bottles. Furmint grapes are not only cultivated in Hungary, but also in Austria where it is known as Mosler, Slovenia where it is called Sipon, and in California, where Limerick Lane Cellars produces two styles: a dry and late harvest dessert. In fact, Limerick Lane Cellars is the only American winery to create wines from Furmint. And their NV Late Harvest Furmint follows as much as possible, the traditional Hungarian methods. Michael Collins, the owner and former winemaker, visited Tokaj and returned with Furmint and Hárslevelu cuttings. After harvesting, Collins and current winemaker Ross Battersby soaked the grapes in their own juice after de-stemming. This allowed the rich flavors from the raisins to be absorbed into the liquid. After pressing, the juice was fermented in old oak barrels and left "sur lie" for three months. The wine was then racked off the lees and barreled for a minimum of three years. The first wine, the 2001 Late Harvest Furmint, exceeded 5 puttonyos and displayed the classic honey and apricot characteristics of Tokaji Aszú. The winery states that this wine is drinking well now and with good cellaring should last long enough for your grand-children to appreciate (at least 50 years). Hungarian winemakers have visited to taste the wine and have been quite impressed. The 2001 Late Harvest Furmint is now sold out, but the current NV Late Harvest Furmint is a blend of three vintages: 2002, 2003 and 2004. This wine has 3 puttonyos of white grape must. Earlier attempts to market Furmint were difficult as "hardly a soul ever heard of it here" – even by California wine aficionados. However, the dry Furmint sold out relatively quickly - even though it was sold strictly from their tasting room as a house white wine. Wine aficionados must be waking up. If you find yourself in Sonoma make sure you visit Limerick Lane Cellars. While tasting the Zinfandel and Syrah, ask about their Furmint and discuss the level of puttonyos and Aszú. The winery will be impressed with your wine knowledge. We were surprised to learn that the most visited winery in the United States is not located in California, nor in New York, but in Asheville, North Carolina: The Biltmore Estate Winery. Considering that the Biltmore Estate is the second most visited residence in the country - after the White House - this fact should not be surprising. The history of the estate and the Vanderbilt family is fascinating reading and the best source is the winery's website. Of interest here is the history of Biltmore's vineyards and winery and the vision of William and Bill Cecil, grandson and great grandson to George Vanderbilt, to establish a world class winery operation. When building the Biltmore Estate, George Vanderbilt demanded that the estate be self-supporting. As a result the estate raised its own cattle and poultry and operated as a working farm and dairy. In 1971, William Cecil planted vineyards containing hybrid grapes, with vinifera grapes following a few years later. 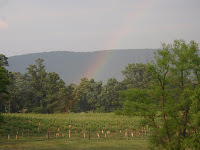 Eventually the vineyards were relocated to the banks of the French Broad River and now contain Chardonnay, Riesling, Viognier, Cabernet Franc, Cabernet Sauvignon, and Merlot varieties. The vines have found a home in that climate, but must overcome one obstacle. Apparently beavers mistake the trellises for trees and attempt to use them as building material. After several years of successfully growing grapes, the next logical progression was to create a winery and start producing wine. They selected a dairy barn as the location and converted it into a winery, tasting facility, and restaurant. Even though North Carolina is gaining a much deserved reputation for growing vinifera grapes, Bill Cecil, Jr., current President and CEO of The Biltmore Company, decided to obtain California grown grapes to ensure a high quality component for their wines. On our visit, we were greeted by Steve Simmons, the Regional Account Manager for the Mid-Atlantic. We had met Mr. Simmons at the St. Michaels Wine & Food Festival and he had graciously invited us to tour the Biltmore. We started at the visitor center, then met winemaker Sharon Fenchak, who along with head winemaker Bernard Delille, craft the large selection of Biltmore wines. Ms. Fenchak explained her and Delille's wine-making philosophy - let the fruit speak for itself, with as little oak influence as possible - and described the quality of the California growers in which they source grapes. We moved to the aging and fermenting tanks, barrel rooms, and then the bottling room. There we were fortunate enough to discuss the bottling process for the sparkling wines with the actual bottler on the line. Mr. Simmons explained that the wines are made Méthode Champenoise in which the fermented wine is bottled with extra sugar and yeast, and then capped with a soda-cap. The bottles then sit for two years, three for the Reserve Blanc de Blancs Brut, and rotated daily on a riddling rack. This process allows the sediment to move easily to the cap for "disgorgement". During this phase the cap is frozen and the sediment is removed along with the cap. The standard Champagne cork is then softened via a microwave and popped onto the bottle. One reason sparkling wine is relatively expensive is that this operation is a manual process. The Biltmore Estate® Château Reserve Méthode Champenoise Blanc de Blancs Brut is made from 100% North Carolina Chardonnay. We had this wine during lunch and it is an excellent dry and fruity wine. The winery also produces a dry Chandonnay - Pinot blend in the Biltmore Estate® Méthode Champenoise – Brut and slightly sweeter bottles of each varietal separately in the Biltmore Estate® Méthode Champenoise Blanc de Noir–Brut and Biltmore Estate® Méthode Champenoise–Sec. Need something sweeter. Try the Biltmore Estate® Méthode Champenoise Pas de Deux – Sec, made from Muscat Canelli grapes. This wine has the aroma associated with the muscat accompanied with a nice apricot flavor. And this wine is available for under $20. In fact all the sparkling wines are near $20, except the Reserve Brut which is still a reasonable $35. There were two observations that we noticed throughout the day. The first was how content every worker we met was working at the Biltmore. Without prompting, each employee expressed gratitude for working for the Cecil's and how they enjoyed their occupation. The second observation is that the Biltmore is great publicity for the wine industry as a whole. When visiting the property, the winery tour is included so each year almost a million visitors taste the Biltmore wines. These visitors learn about lesser known grape varieties as well as the more popular Cabernet and Chardonnay. And if you think everyone has heard of Cabernet Sauvignon, you are mistaken. During our tasting a gentlemen from the previous group returned to the tasting bar to have our tasting assistant pronounce his favorite of the day: Cabernet Sauvignon. After his visit to the Biltmore, that person will more than likely purchase Cabernet from other wineries and a wine consumer is born. This was one of our most enjoyable winery visits and we want to thank Mr. Simmons and the Biltmore staff for their service. We look forward to our return. When visiting the property give yourself a complete day to tour the residence, the gardens, and the winery. You will most likely come to appreciate - as we did - Olmsted's handicraft in designing the gardens. Conservationists will also appreciate Olmsted's efforts to reclaim over-used farmland by converting the land back to forests. And look for the bamboo. While traveling through Tennessee on I-81, we saw signs and then the chateau for Corey Ippolito Winery and quickly exited. We learned that the winery is the newest in Tennessee, yet the vineyards have been producing grapes since 1999. In fact, Corey Ippolito Vineyard was the first vineyard to successfully grow Traminette, in which the state is now taking an active role in subsidizing the planting of this grape. Many of the other estate grown grapes are Labrusca (Carawba, Niagara, Steuben) with the remaining being Cabernet, Cynthiania, Golden Muscat and Leon Millot. Oh yea, and Sunbelt, a grape created by the Arkansas Agricultral Experimental Station. Bascially the grape is a concord with the hardiness to endure warmer weather. After growing these grapes and operating a bed and breakfast onsite, the next logical step was to start producing wine. After many years operating as amateurs and winning medals in several competitions, the winery opened to the public this year. The wine selection was as diverse as the estate grapes. There were three styles of white wine: a dry Chardonnay, a semi-sweet Rocco Bianco, and the semi-dry Traminette. This last wine had the spicy aroma and flavor characteristic to the variety and was our favorite among the white wines. For reds, they offer a dry Merlot, a dry Cynthiana, and the sweet Bella Rosso Red - a blend of several of the labrusca grapes. The Cynthiana was good for a young wine. It didn't have the acidity associated with some new Norton wines and was drinkable now. Give it a few more years in the bottle and the wine will improve even more. The final select of wines was a mix of fruit, muscadine and blush styled wines. The Muscadine wine was really good; it had the fruit flavor of the grape without the syrup or grittiness that some muscadine wines possess. The Catawba based Sonnino Sunset Blush was also a good wine for this blend. It is made semi-sweet but tastes more dry than sweet. What is sweet is the Blackberry wine, made in a dessert style and even more interesting when mixed with shaved ice. 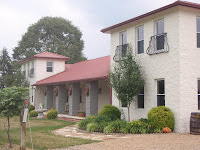 If you find yourself driving along I-81 at the Virginia-Tennessee border, visit Corey Ippolito Winery. What a great break from the road. 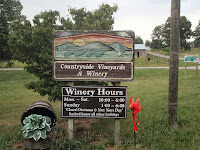 When we detoured off I-81 after seeing Corey Ippolito Winery, we found another winery: Countryside Vineyards & Winery. Surrounded partly by the Appalachian Mountains and hidden from nearby I-81, Countryside looks like a secluded farm - with sheep and donkeys grazing near the vineyards. The vineyard grapes were planted in 1987 and the winery started operating four years later, selling just three wines. Today that list has expanded to 20 wines, most winning medals in state and national competitions. The wines range from dry to sweet and from hybrids to labrusca and fruit wines. The dry Chambourcin is their most award winning red and they also produce a more fruitier nouveaux styled Chambourcin using whole berry fermentation. They also offer full bodied Merlot and Leon Millot wines; but their best selling wine is the sweet Countryside Red - made with the Buffalo grape. This is a less foxy sibling to the Concord and another product of the Cornell University's Geneva, New York experiment station. Another sweet red is the Autumn Harvest - made from Steuben. For blush styled wines, their is the standard Blush - a blend of several varieties, a Muscat Blush, and the Steuben - one of their best sellers. For whites, they offer a dry Chardonnay and Vidal as well as a semi-dry Vidal. 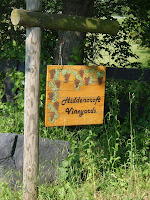 The sweeter whites are the Niagara, Countryside White, Muscadine, Just Peachy (grapes and peaches) and Golden Muscat - which has the unique floral muscat nose. And finally, there are two fruit wines: Blackberry and Strawberry. We did not have the change to spend much time at Countryside - but based on the number of visitors who came through the doors - this is a very popular destination. Perhaps the highest quality wine produced by native grapes comes from the Diamond grape. Created in New York in the late 1800’s by crossing the popular Concord and the Iona (vinifera-labrusca) hybrid, the grape possesses many of the same characteristics as it’s more familiar parent. Diamond wines are usually clean and fruity (pineapple flavor), with a sweet finish. New York’s Goose Watch Winery is arguably the largest producer of Diamond wines; the winery produces over 4,000 cases of Diamond as well as blends the grape in several wines. David Peterson, the General Manager of Goose Watch Winery as well as its sister wineries Swedish Hill and Penguin Bay, states that the winery produces Diamond wine because he considers this grape the best quality potential of any native grape in the region. In fact, the winery has realized this potential as their semi-sweet Diamond wine has won 6 Gold medals in 2005 in addition to the “Best White Wine” at the 2005 Riverside International Competition in California. The New York wine public apparently agrees with these officials considering that Diamond wine is the winery’s best selling wine. Another New York winery, Fulkerson Winery, vinifies the Diamond grape because it is very hardy during New York winters and grows well in their vineyards. As a bonus their Diamond wine displays a pleasing "pineapple" flavor characteristic and is less pungent than other white native varieties. Fulkerson Winery is located on a 200 year old family farm and is owned and operated by a 6th generation Fulkerson, Sayre Fulkerson. Mr. Fulkerson opened the winery in 1989 after selling grape juice for the previous ten years. Fulkerson Winery makes their Diamond wine as dry as possible – although a little sweetness is necessary to bring out the "native" potential. According to Mr. Fulkerson, the wine’s popularity is increasing, both within the general public and wine officials. Over the last ten years, their Diamond wine has won awards throughout the United States and in 2005; their 2003 vintage won Gold at the Great Lakes competition and Silvers at the NY Wine & Food Classic and the NY State Fair. To see more producers of Diamond wines, visit the Wine-Compass.com Wine 101 page. The New York wine public has proven that they are more than willing to support native wines such as Delaware, Cayuga, Catawba, and Diamond. Whether these Vitis Labrusca wines remain regional products or take on a more national following, we shall see. We read two interesting items in the June/July issue of the Mid-Atlantic Brewing News that we'd like to share. First Vermont's Magic Hat Brewing Company purchased Pyramid Breweries, producers of one of our favorite Hefeweizens. The rational behind the purchase is that it allows Magic Hat to expand marketing territory on the west coast and gives a financial boot to Pyramid - which possibly lost $1.8 million in the 4th quarter 2007. At that rate it would take Pyramid 3 years to burn through the $25 million sale price. The second item pertains to the current hop "crisis" that we wrote about earlier this year. See Hops & Barley Shortage article. The Boston Beer Company, makers of The Samuel Adams Beer, evaluated their hops inventory and chairman Jim Koch decided to sell part of that inventory to other craft brewer at cost. They started a "Hops Sharing Program" and donated 10,000 pounds of Tettnang Tettnanger (German) and 10,000 pounds of East Kent Goldings (English) to the program. Other craft brewers with surpluses also contributed and the communal inventory was allocated to other breweries based on a lottery. This process allowed dozens of craft brewers to retain beer recipes without eliminating them altogether or altering their composition. The craft brew industry and consumers are most fortunate. Thank you Jim Koch and The Boston Beer Company. After a day spent hiking and fishing at Cunningham Falls State Park, we returned home via Brunswick into the Loudoun Wine Trail. Our intended destination was the newly opened Notavina Vineyards. However, we were side tracked when we saw the Wine Tasting sign for Hiddencroft Vineyards, another new winery, that we thought was only open via appointments. We quickly backed up and slowly traveled the gravel road to the winery. When we saw a few other vehicles, we knew the sign was not mistaken, Hiddencroft was actually open to the public. We soon learned that after their initial opening May 3rd 2008, they had intended to open by appointment only, but they received so many requests that they decided to open regularly on weekends. After growing vegetables to sell at farmers markets, Clyde and Terry Housel wanted to grow something a little more drought tolerant. They decided to convert the farm to grapes and planted several types of Labrusca and hybrid grapes to learn how to cultivate and produce wine. Starting with Concord, Steuben, DeChaunac, and Foch; they experimented with winemaking and grape growing until they found the best combinations: Traminette, Vidal Blanc, Chambourcin, and Cabernet Franc. The current vineyard was planted by hand and irrigated by Terry with a garden hose. With the assistance of Doug Fabbioli, who seems to always be available to mentor new wine producers, they have been able to "hand-craft artisan wines, concentrating on varietals that excel in Virginia's climate". The current selection of artisan wines includes a Traminette, Chambourcin, Cabernet Franc, and Sweet Cherry. We started with the Traminette which is more than appropriate on a 90+ degree day. Blended with a small portion of Vidal Blanc, the wine possesses the flavors of each grape, but the characteristic spicy flavor of the Traminette - whose parent is Gewürztraminer. A summer wine. We next tried their "nouveau" styled Chambourcin, where they took half their supply of the wine and aged for future use, and bottled the remainder after only a few months in oak. The result is a very fruit forward wine - that could also be served chilled - with a dry finish. But the fruit retains a mouth feel of flavor from start to finish. The meatier Cabernet Franc was next and this wine has a similar fruity composition as the Chambourcin, but a more peppery finish. I can't wait to try this wine with a steak. The final bottled wine, was the Sweet Cherry, a surprisingly drier wine than the name implies. Made from 100% montmorency cherries the wine tastes a little like a sugar free cherry pie. The tail is tart - which gives the impression of a dry wine. And Hiddencroft provides the obligatory chocolate morsels to enhance your temptation. Our favorite wine, however, hasn't even been bottles. Aging in the Barrel Room are a few barrels of Tannat and Petit Verdot in which Clyde originally intended to blend with the remaining Chambourcin. After sampling the Tannat in the barrel, we agree with his assessment to bottle it as a vintage. It is already smooth and flavorful - and will improve more with age. With samples like this, Tannat may well be a suitable grape for the Virginia climate. The Housels are completely hospitable and provide an environment to relax on the porch with a bottle in hand. We also appreciate their assistance during the "accident". Thanks and see you soon. From Hiddencroft Vineyards, we headed to our initial destination, the newly opened Notaviva Vineyards. We have been following the winery's progress, along with hundreds of others, from the winery's blog. Owners Stephen and Shannon Mackey documented each phase of development, from planting the vineyard, to building the winery and tasting room, to bottling the wines. This clever strategy created a brand following or loyalty, without a product. This loyalty increased, upon meeting the owners and hearing their interesting story. While still dating and spending a day at Breaux Vineyards, they rhetorically asked, what type of people own wineries and why couldn't they. After a short period of quiet reflection, each asked the other, were you serious? Yes. And a week later they purchased the property in which their vineyards currently reside. They were in the vineyard\winery business with no farming or wine making knowledge. Oh yea, and they lived in Connecticut. Each weekend they drove 6 1/2 hours to tend the vineyard. If that was hard enough, then they got married. In the meantime, they made the move back to Virginia and used bonuses and savings to purchase farm and wine making equipment. Thankfully, Doug Fabbioli once again stepped in to mentor the couple, giving much needed advice and encouragement. Over 5 years of struggle, the winery was completed this spring and the Mackey's were in business; their "Dream, Build, Believe" philosophy had prevailed. We strongly encourage readers to visit the Notaviva Blog; it is a fascinating read. In order to retain brand loyalty a company must offer a quality product and Notaviva is attempting this in both the wine and music spheres. Regarding the wine, this weekend they had just finished bottling their initial selection, and had two available, the Music Series Vivace Viognier and "Dream" Series Believe Tinta Cão. The Viognier is really good; it has possibly the strongest aroma of any wine we've tried. The wine has a strong grapefruit-citrus flavor and a refreshing acidic finish. Well done. The Believe Tinta Cão is a port wine without the fortification - the wine possesses the "robustness" of the grape and for those that like a good port - you won't be disappointed. In the coming weeks the remainder of their wine selection will become available which include the "Cantabile" Cabernet Franc, "Dream" Chardonnay, and "Build" Chambourcin. In the meanwhile Notaviva rounds out their portfolio with selections from Fabbioli Cellars Tre Sorélle and Raspberry Merlot, North Gate Vineyards Chardonnay, and Sunset Hills Vineyard & Winery Cabernet Sauvignon. Notaviva refers to the Italian words nota - music note and viva - with life. The Mackeys hope to build an environment in which people will be exposed to a wide array of musical styles, be it celtic, world, bluegrass, folk.... Philosophically they believe that people with diverse cultural and political views can all appreciate the same music. Thus Notaviva Vineyards will host several diffuse acts this summer from Chelsea Lee and Todd Wright to Richard Barry, the Brogue Rogues, and Furnace Mountain. And in the future, expect performances for children in the morning, with a more adult flavor in the afternoon. We wish our summer plans could incorporate all these acts, but we will make a strong effort to attend a few. Their trademark is appropriate. Notaviva Vineyards: Wine - Music - America. We learned this morning that the very first Virginia winery that we visited, Oakencroft Vineyard and Winery, is planning to close after 25 years. The winery was the oldest in Albemarle County and the closest winery to Charlottesville. UVA students will be very disappointed - as we are. Understandably Felicia Rogan has decided to retire and the land has been sold, but in a conservation easement, so that it will stay undeveloped. The Virginia wine industry owe Ms Rogan gratitude for she was instrumental in creating the Monticello AVA and created and served as director of the Jeffersonian Wine Grape Growers Society. 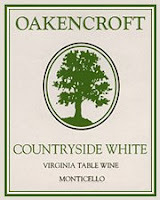 Oakencroft will remain open until the end of 2008 - so their event schedule will remain intact. Apparently their current release of Cabernet Franc and Reserve Chambourcin are outstanding - so plan a visit to Charlottesville to obtain a collectors item. 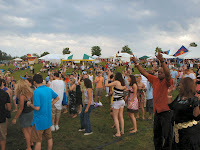 Despite some nasty weather, on Saturday May 31st we were able to enjoy wine and music at the 27th annual Vintage Virginia festival. 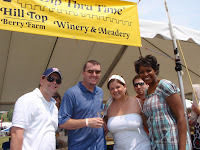 The festival highlights the growing Virginia wine industry - and over 50 wineries participated - pouring over 350 different wines. Virginia is best known for their Viognier and Cabernet Franc, but there are also excellent examples of Norton, Chambourcin, Chardonnay, Sparkling wines, fruit wines, and mead. Besides the wines, each year Across-the-Way Productions brings together awesome local and national acts and this year was no different. A review of the music is available at the MyJoog Blog. The day started rather warm and we decided to start with white and rosé styled wines at a couple favorite wineries: Village Winery and Gabriele Rausse Winery. Village Winery was pouring an excellent Viognier and Apple Wine and Gabriele Rausse was pouring an excellent Viognier and a dry NV Rosé. We also sampled the Mead and cyser products from Hill Top Berry Farm & Winery in preparation for a winery visit this summer. Their mead is outstanding. Next door, at Rebec Vineyards, we tasted two interesting wines, The Landmark White a blend of Viognier and Rhatsiteli and the Sweet Sofia, a wine made from a Bulgarian recipe - also from Rhatsiteli and lots of spices. Our pal Dezel joined us and we proceeded to sample excellent wine from Wintergreen Winery (Viognier, Apple Wine), Chrysalis Vineyards (Viognier), Barboursville Vineyards (Rosé), Horton Vineyards (Petit Manseng, Rhatsiteli), Sweely Winery Estate (Viognier) -- then the storm hit. After a few bolts of lightening, we found shelter in the parking lot and then a second time, in a tent. What a mess: Lightening, tornado warnings, downpours. And then, right when we were ready to call it quits, the sun came out. During the break, a fellow attendee had commented that Veritas Vineyards - particularly their - Vintner's Reserve was his favorite so we immediately proceeded to see why. We tried their entire selection, and yes, the Vintner's Reserve was very good. We also liked the Claret (Cabernet Franc and Petit Verdot), Red Star (Cabernet Franc and Chambourcin), and Rosé and for whites, the Viognier and Sauvignon Blanc. We might have to take a trip to Afton soon. We then ventured to two new wineries, Sunset Hills Vineyard & Winery and Holly Grove Vineyards. Sunset Hills (Purcellville) was pouring a nice Viognier and Petit Verdot. Holly Grove is located on the eastern shore so this was a great opportunity to taste their products. The Chardonnay and Merlot are already multiple medal winners, but our favorite was the Sunset Rosé. This is the wine we finished the day with while listening to Ivan Neville's Dumpstaphunk. Before that, however, we did spend some time at Kluge Estate Winery's tent and we were impressed with their SP Blanc de Blancs and Kluge Estate Cru. The Cru is interesting in that the Chardonnay grapes are fortified with Virginia-distilled brandy, and then aged for six months in Jack Daniel’s® barrels. Obviously, due to a long break caused by the erratic weather we didn't get a chance to visit most wineries; but the day was still a success - with great wine and music.